Low on time? Highly concerned about health and deliciousness? 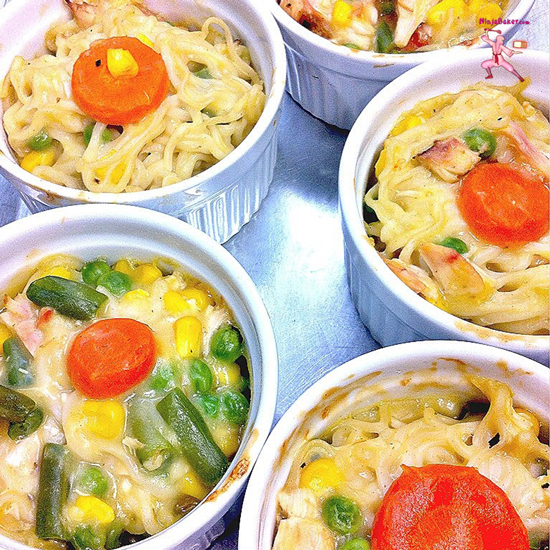 Chicken ramen mini casseroles are your kid-friendly solution. My chicken ramen mini casseroles are also a fantastic way to use leftovers in a flavorful fashion! Adapted from Campbell Soup's Hearty Chicken & Noodle Casserole recipe. 1. Boil ramen noodles (without the seasoned soup packet) in 2 cups of water. Drain. 2. In a large pan, over medium-low heat, gently stir together the ramen, veggies, coconut milk, soup and chicken. 4. Bake in a 400 degree oven for 20 minutes. 5. Serve hot and savor the smiles of happiness on the faces of friends and family.